Constantine Priggos was born in Constantinople in 1892. (The opinion of some that he was born in Zagora of Magnesia is wrong.) He studied until the fourth grade of high school in the Zographeion Gymnasium of Constantinople. In 1915, he was married to the also-Constantinopolitan Helen and had thee children: Byron, Alike and Kyvele, who died in 1950. He was taught the first music letters at the age of ten by the Archcantor of the cathedral of the Entrance of the Mother of God, at Peran, Musicteacher Efstratios Papadopoulos Byzantios, the so-called Kamboures, and became first Canonarch. Then his private teacher at home was Michael Mourkides, Protopsaltes of the Church of the Holy Trinity at Peran, who was known for his good voice and musical experience. Both of his teachers had been students of the Archon Protopsaltes of the Great Church of Christ, George Rhædestenos II, the great performer of ecclesiastical music. Afterwards, for approximately four years, he studied at the Patriarchal Music School, where he was taught by Iakovos Nafpliotes and where he perfected himself on the theory and the orthography of Byzantine music. His psaltic career is quite interesting. In particular he chanted in the following churches. From 1908 until 1909, second cantor St Apostles Ferikioy. From 1909 until 1911, first domestikos Holy Trinity at Peran. From 1911 until 1913, second domestikos of the all-revered Patriarchal Church. 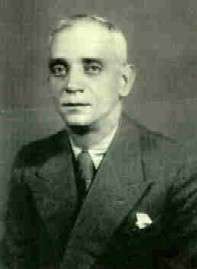 At that time, Iakovos Nafpliotes was Protopsaltes, Constantine Klavvas Lambadarios, and Demetrios Phokaeus first domestikos. From 1913 until 1915, Archcantor at St Demetrios, Tatavla. From 1915 until 1916, second cantor at Holy Trinity, Peran. From 1916 until 1925, Archcantor in the same church. From 1925 to 1926, Archcantor of National Foundation of Tinos. From 1926 - 1929, Archcantor of St Paul, Kavala. From 1929 - 1930, Archcantor of Panagia Acheiropoietos, Thessalonica. From 1930 - 1933, Archcantor of Meeting of the Lord, Thessalonica. From 1933 - 1936, Archcantor of the Holy Trinity, Peran. From 1936 - 1937, Archcantor of St John of Chios, Galata. From 1937 - 1938, Archcantor of St Demetrios, Tatavla. In the last two years, he had as his left cantor, and consequently as his first domestikos, Basil Nikolaides, ther profound and untired student of our traditional music, who afterwards became Protopsaltes of the Patriarchal Church. This appointment was greatly influenced by the verdict of Iakovos Nafpliotis, who said: «In order to preserve the patriarchal style, Priggos is the only fit», which finally was accepted, since the then First Domestikos Anastasios Michaelides, the very experienced and profound knower of the patriarchal order, from whom Priggos and Stanitsas learned many things, because of his unfit voice was not judged worthy of promotion. As Archon Lambadarios, he chanter until March 1939, when the Archon Protopsaltes Iakovos Nafpliotes asked for a six-month ἀναρρωτικὴν ἄδειαν, after which he resigned from his post. From 1st March 1939 until 23rd September, Priggos was acting Protopsaltes, whereas from the 24th of September 1939 until the middle of 1959, when he resigned due to ill health, for 20 years, he was the Archon Protopsaltes of the Great Church of Christ. From 1957 already, suffering from παραπληγίαν, he could walk with difficulty, and with the help of friends he would go to the analogion, because of the weakness of his lower limbs. Then, in order to be healed and not having where to rest his head, Priggos goes to Greece, where for 3 and more years he stays in the hospital «Evangelismos» (Annunciation). And we reach February 1964. The choir of the Association of Constantinopolitan Friends of Music was gathered in the room of Panagia at Stavrodromion, ready for its final practice before its forthcoming concert, and waits for its leader T. Stanitsas, who is late. Suddenly the door opens and Priggos arrives in tears. With a trembling voice announces the death of Priggos. He sits on chair and cried as a small child. You see, fate arranged that he be the messanger of the sad news of the death of his collegue for 20 years. «At the arrival of death, everything disappears.» The fatal must have happened so that the human imperfections leave their position to awe and mercy. His funeral service was sung in the Metropolis of Athens by the Association of Friends of Byzantine Music, and his burial took place in the third cemetary of Athens. Later, a collection was initiated by the renowned musicteacher and distinguished man George Tsatsaronis. A substantial amount was raised and given for the erection of a monument in the Cemetery of Nea Smyrni to the memory of all the cantors of the Ecumenical Patriarchate after the Fall. There, in 1972, the collection of the bones of the ever-memorable Priggos, at the presence of the Metropolitan of Belgium Aimilianos Zacharopoulos, who delivered a suitable speech.